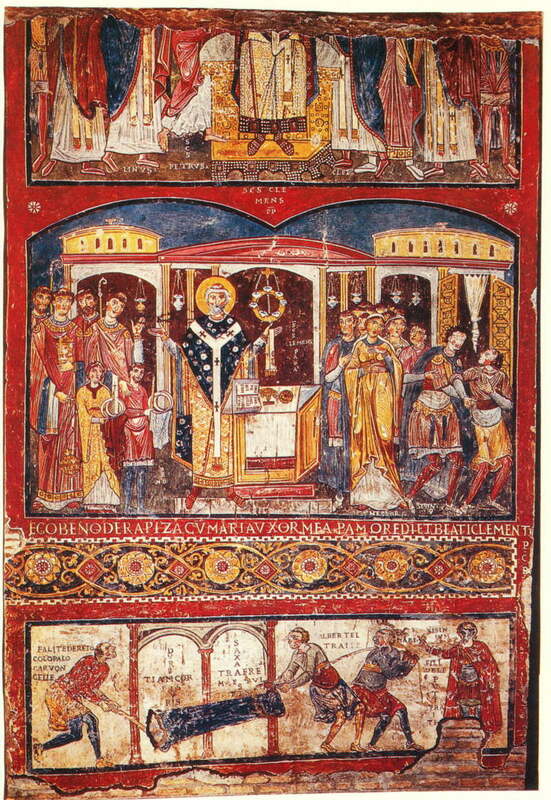 The painting depicts a scene from legends concerning the life of St. Clement, which survive in a Greek hagiography of unknown date.2 In the first panel, a favorite (“φίλος”) of the emperor Trajan named Sisinnius has been consumed by jealousy and has followed his wife Theodora, who had recently converted to Christianity, to church. The panel shows Pope Clement, exactly as the passage tells it, beginning the prayer (“εὐχή”). His arms are outstretched and held slightly up, a common position adopted for prayer in early Christian worship. Meanwhile Sisinnius, on the right, is being led out of the church by his servants after being struck blind and deaf. Unlike Paul, however, Sisinnius was not immediately converted by the restoration of his sight. Here the wording of Clement’s quote “Ἡ σκληρότης τῆς καρδίας σου εἰς λίθους ἐτράπη” (or “DURITIAM CORDIS” in the Latin inscription) reveals the source. This is undoubtedly a reference to God’s speeches to Moses in Exodus commanding him to confront the Pharaoh. Take for example this one, “ὁ δὲ ᾿Ααρὼν ὁ ἀδελφός σου λαλήσει πρὸς Φαραώ, ὥστε ἐξαποστεῖλαι τοὺς υἱοὺς ᾿Ισραὴλ ἐκ τῆς γῆς αὐτοῦ. ἐγὼ δὲ σκληρυνῶ τὴν καρδίαν Φαραὼ καὶ πληθυνῶ τὰ σημεῖά μου καὶ τὰ τέρατα ἐν γῇ Αἰγύπτῳ.”9 God uses the same terms for hardening Pharaoh’s heart (“σκληρυνῶ τὴν καρδίαν”) as Clement uses of Sisinnius (“Ἡ σκληρότης τῆς καρδίας”). The legend of Clement and Sisinnius is representative of a kind of double rhetoric concerning converting pagans which is often found in early Christian texts. On the one hand, the example of Paul shows that conversions happen, and that even the most violent enemies of the church can become apostles. On the other hand, the example of Pharaoh shows that when conversions do not happen, the fault does not lie with lack of truth or righteousness on the part of the Christians. It lies with the hardness of their enemy’s hearts, a condition controlled only by God. Together they provide a powerful rhetorical tool to sustain a congregation through a period of persecution. Tertullian and Irenaeus, our two earliest sources for information about Clement, mention nothing of the story. Acts 9.3-8. For the Greek text click here. For an English translation click here. Exodus 7.3-4. For the Greek text click here. For an English translation click here.